Be informed—the FCC is scheduled to vote on December 14th. “Net neutrality” is a hot button issue, but will it affect you or your school? Those who want to end net neutrality promise that less regulation will mean more innovation. The move could also limit consumer choice and lead to increased costs. Many educators worry that the potential change could deny access to online resources. It may leave districts with little choice—and at the mercy of their internet service provider (ISP). Here’s why it matters most for educators and what you can do. Net neutrality is currently protected by Federal Communications Commission rules that ban ISPs from blocking content. The rules also ban so-called “fast lanes” for companies willing to pay more to deliver their content faster. New FCC leadership in the Trump administration wants to roll back those regulations outlined in the agency’s 2015 Open Internet Order . The current order ensures broadband providers treat all internet content and services equally. The FCC is scheduled to vote on the matter Dec 14. Republican FCC Chairman Ajit Pai advocates what he calls a “light-touch” framework that would put “technologists and engineers, rather than lawyers and accountants, at the center of the online world.” He wants to lift the rules on companies’ ISPs, such as Verizon, Comcast and AT&T, from favoring some content over others. This would no longer treat the businesses as utilities. Chris Lewis, vice president of the non-profit Public Knowledge, views a change to the FCC rules much differently. His organization is one of 40 that signed a letter urging the FCC to delay the ISP regulations vote. If the FCC proposal goes through, ISPs may stop users from visiting some websites and provide slower speeds for services. It may even redirect users from one website to a competing website. This may discourage small entrepreneurs and startups from entering the market, Keith Krueger, chief executive officer of CoSN, says. Tiered pricing may be structured to benefit incumbent companies and would disadvantage new entrants into the education technology market. K-12 schools that rely on free access to online content may lose choice in materials and resources. They would be dependent on deep-pocketed sources with fast lanes. Other material may take longer to retrieve. Teachers want to be able to have choice in accessing online services. They want tools to help differentiate instruction and provide additional classroom support. Lewis says the FCC proposal would narrow options available to schools and raise costs. “It’s important that the market has rules of the road so consumers, students and educators are making the choices not based on one preferred source or who has the greatest capital,” he says. Classroom teachers are increasingly leveraging online resources for instruction today. 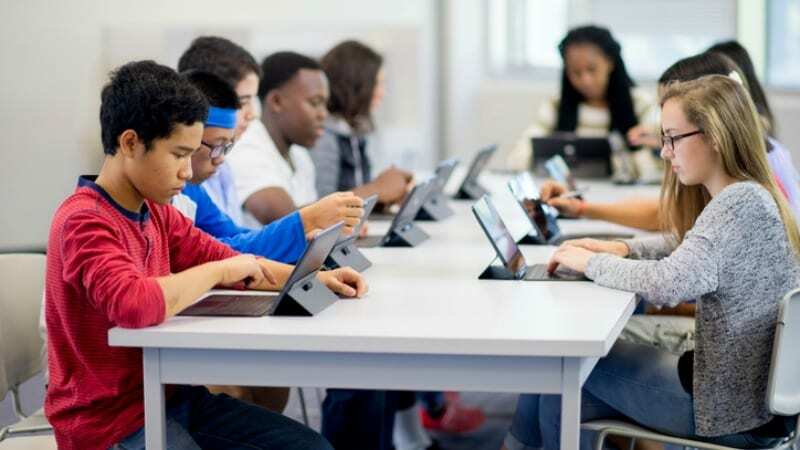 In its annual State of the States report, the nonprofit EducationSuperHighway found that 94 percent of districts now have high-speed broadband, reaching more than 39 million students in 74,000 schools. Krueger says that it’s possible that schools could be stuck with higher costs for digital content without net neutrality. This is especially a concern in areas without competition for service. A recent CoSN infrastructure survey revealed that 43 percent of school districts have only one available ISP and most of those (52 percent) are located in rural areas. In addition, many students also lack choice at home. Nearly 56 million American households do not have high speed broadband choice. Pitler says it would take a groundswell of public pressure to change what will likely be a vote by the FCC this week to end net neutrality. He says that a legislative fix may be needed to make sure the internet stays protected as a public utility. Krueger says it’s important for teachers to urge caution and speak up on the issue. He expects it’s “highly likely” that a majority of the FCC commissioners will agree to repeal the rules, and legislation would be a tough sell to a Republican majority Congress. Lewis anticipates the debate will continue for some time—with efforts to block changes through the courts or legislature. “Congress will keep an eye on this. It’s so important to the economy and to the average American,” Lewis says. For more information about the direct impact of ending net neutrality on schools, read this article. And to join in the fight for broadband competition, go here.